San Francisco pays tribute to TTC’s historic Red Rocket – "I KNOW TORONTO!" San Francisco is paying tribute to the Red Rocket. The non-profit arm of the city’s transportation agency has painted one of its historic streetcars red and embellished it with the TTC logo to honour Toronto’s dedication to the distinctive Presidents’ Conference Committee (PCC) streetcar. 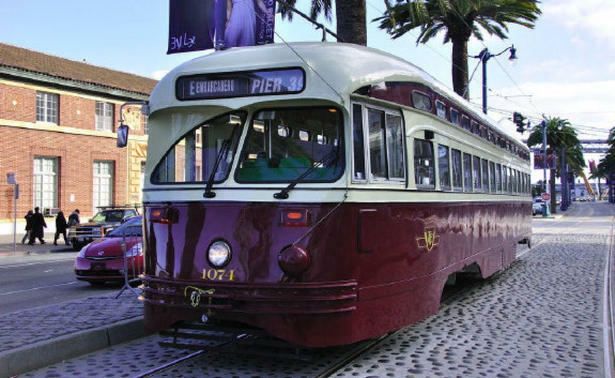 “Toronto is one of the cities we honour because of its longstanding commitment to streetcars,” said Rick Laubscher, president of Market Street Railway, the non-profit arm of the San Francisco Municipal Railway that aims to preserve historic transit in San Francisco. “The reason why Toronto was chosen is because it is iconic among transit fans in North America for having the continent’s most extensive streetcar system today, and one of the biggest ever,” said Laubscher.